K Carberry: I'm still loving the spring colors! Welcome to rural Georgia! I'm still loving the spring colors! Welcome to rural Georgia! 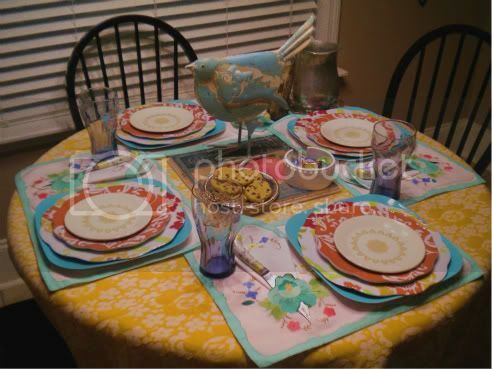 It's time for Tablescape Thursdays at Between Naps on the Porch! Be sure to go look at all of the beautiful tablescapes linked there! So, I almost missed out on tablescaping this week because I got behind in my "chores" while I was off enjoying the North Georgia Mountains this past weekend. We had a wonderful weekend and I'll be posting photos soon. Some of the highlights (other than my first time ever going to a Drive-In theater) were the many, many antique and thrift stores we stumbled upon. It seemed as if everyone was selling things! Luckily for me, I found quite a few little treasures. Click on the photos to see the full image. 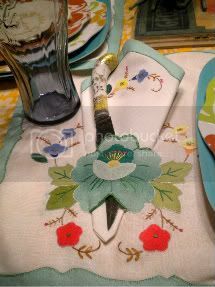 I fell in love with the placemats and napkins pictured below the minute I saw them in the Hiawassee Antique Mall. I couldn't wait to find the perfect dishes to go with them. 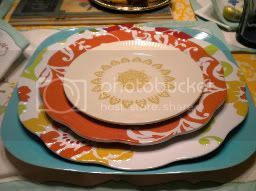 And then I remembered that I had recently purchased some of the new Better Homes and Gardens melamine plates at, of all places, Wal Mart. I bought them for outdoor picnics, but they seemed to want to sit on these placemats! Later that day, I stumbled upon these unmarked saucers and thought they were pretty. When I decided on my tablecloth, they wanted to join in today too! The "tablecloth" is actually just a ream of vintage fabric that I found in Goodwill last month. I had planned to get someone to make it into a tablecloth for me, but decided to go ahead and use it for this. The glasses here are honestly ones I never thought I would be posting online, but they seemed to fit. They are the Coke glasses that came free with McDonald's value meals last year, haha! Mr. Birdie flew in from Hobby Lobby, one of my favorite stores for home accents, since I like to change up things often and their prices allow me to play with home trends. The "Georgia Peaches" plaque that birdie and our sweets are sitting on came from Target about ten years ago. I bought it in Virginia Beach, VA. I stumbled upon it one day when I was very homesick and I've loved it for many years now! The silverplate saucer and white candy dish have been around my house for a while too, they always come in handy! I need somewhere to put those fresh Easter Reese's cups! The pewter pitcher, although beaten up is one of my favorite items. I live on a street called Pewter Court, so I've started collecting more pewter, as "corny" as it sounds. I really love my neighborhood though! The pitcher sits atop a hibiscus plate that was a gift from a friend many years ago. I hope that you enjoyed your trip to my breakfast nook! Maybe one day I will actually get some daylight photos for you all!! Thanks for looking! I loved visiting your Table setting! I have been looking at those wonderful dishes at Walmart! They keep calling my name.But not so sure what I had to go with them. Your finds are awesome! Just perfect linens for this lovely table! Oh, I love the bird! I just adore this setting! I take a glass of Iced Tea in my coke glass! It's so nice that you have memories of when you buy things. I love the bird and the way you stacked the dishes with complimentary colors...way cute. It's amazing how everything seemed to come together for this tablescape. I'm glad you could use you Walmart dishes with the pretty napkins and placemats. Oh, I love all of your finds, especially "Mr. Birdie!" Great job! WELCOME! OTP is Old Tyme Pottery that has a tremendous amount of great home oriented pieces/deals. Do you have one where you are? I love all your orange & turquoise colors! I'm not familiar with the Prill flatware so I'm going to google it & learn something. Your table is such fun! I love the colors and especially adore your big bird. Thanks for sharing. 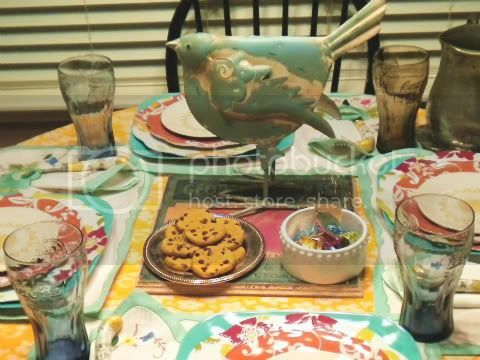 I love your colorful table and that cute cute bird. I love birds. What a beautiful tablescape! I love your antiquing finds...they go perfectly with the pretty dishes. I saw them and almost bought them too...hmmm, I might have to go back. Happy Anniversary & Thanks for visiting my blog!! 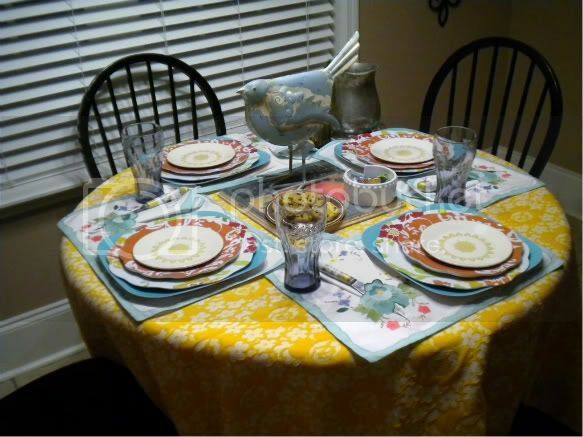 What a colorful spring table, from the tablecloth, to the placemats to the dishes...great job! The bird centerpiece is awesome. It doesn't matter what plates we sets, expensive or cheap, when you put them togethem, prices doesn't make the different. In my eyes. It's the feelings on how you sets. I love this colourful setting. What a great tablescape!! Love all those colors together! That bird is a hoot!! Love the idea of collecting pewter items for your Pewter Street! LOL! Enjoyed seeing all you did! It even matches the sides of your blog! What a pretty tablesetting. I love the colors and that big ole' bird in the center is just the best! Your tablesetting is very nice and colourful. The turquise and orange make a good contrast. But as a flatware collector I am thrilled by your Prill knives. I have seen similar knives with porcelain handles from German Makers but now I googled and found several pictures of Prill Ware. Really adorable. And so suitable to your china. Really stunning. Thanks for visiting my blog! Your table scape is adorable. I love Hobby Lobby too! I spend way too much there. This is so pretty! I love how you've put this pretty table together -- with all the layers of colors and patterns. What a cheerful table.! Hello Kristy! What a great table. So much eye candy. I love the patterns and the layering and the colors!